This multi-purpose, triple-enzyme and surfactant formulation is intended for reusable medical devices with narrow channels and lumens. When used as instructed, the PureChannel Flush formula is safe for most delicate rigid and flexible endoscopes and has proven to meet or exceed the performance of other widely used enzymatic products. The liquid use dilution is an effective pre-soak and cleaner that is flushed through device lumens to break down and remove organic soils within the channels. 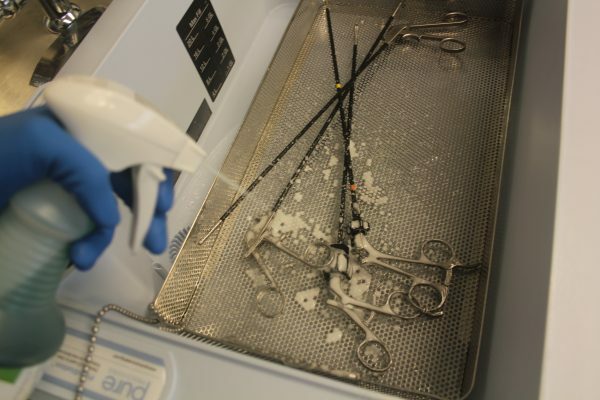 The foam, when sprayed on instruments’ outer surfaces, breaks down protein and fatty soils while also maintaining surface moisture until used devices are transported to the decontamination area for reprocessing. When used as a soaking and cleaning solution, the recommended dilution rate is 1/4 oz. per gallon of water. For use as a spray foam, the formulation is used at full strength. 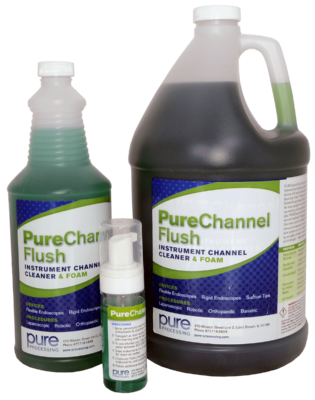 PureChannel Flush cleaner can be used in sonic systems and sonic irrigators. 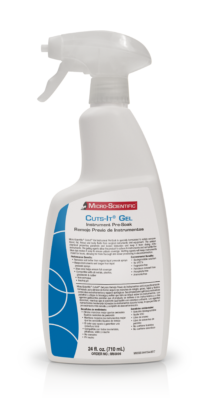 Cuts-It Gel Instrument Pre-Soak is specially formulated to safely remove blood, fat, tissue and body fluids from surgical instruments and equipment. The gelling agents allow the product to adhere to instruments and soil while the blue dye makes it easy to ensure uniform coverage. Immediately softens and helps dissolve blood, fat, tissue and other body fluids. Reduces likelihood of rust, tarnish or corrosion. © 2019 Pure Processing LLC. All Rights Reserved.